Hello everyone in Fla., I wanted to drop you a line and thank you for providing us with such a fine dog. S'eamus is going on 6 mos. now and watching him grow for the past 3 has been a true privilege. When you look back on your life it is hard to find very many transactions that ended up either the way you thought they would or the way the others involved in them assured you they would. When I look back at purchasing a puppy from Laura Kennels I can do nothing but smile. You assured me that you would help me find the puppy that fit me, you did. You assured me that the puppy would be intelligent, healthy and even tempered, he is. You assured me that the dogs this puppy would come from were loving family companions, S'eamus is the quintessential family dog. I spent 3 years researching this breed, looking for the "perfect" fit, I was under no disillusion that I would find this, but I figured that I would try to get as close as I could. Well, everyday that I come home and S'eamus meets me at the door, wagging his tail so hard that he can hardly keep his back feet under himself, I realize that with a little help from my friends in Florida, we hit the nail on the head. Lynn, I am not lying when I say that S'eamus has been the perfect child, he has chewed up nothing, minimal stains on the carpet, he is courteous to visitors, eats his food and leaves us alone when we are eating ours. These may sound like minor things, but they are all things that make having a puppy a trying time. 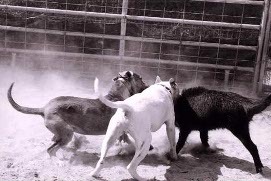 Another reason that we picked Laura Kennels was that all of their dogs come from long lines of working bulldogs, hog hunting was something I enjoyed when I was younger and something I wanted to get into again. In the past three months, I have said that if you saw S'eamus and didn't know anything about him, you would at least know he was a Bulldog. Well, If you saw him this weekend, and knew nothing else about him, you would know he was a catch dog. S'eamus is deliberate and methodical about EVERYTHING he does, he doesn't jump into any situation without circling it 8 or 10 times first to see what the best plan of attack is. I had no misconception that he would do anything with the hog I was taking him to meet this weekend. I figured that we would be doing good to get him close to it, maybe smell it, if he got really worked up he might bark at it. 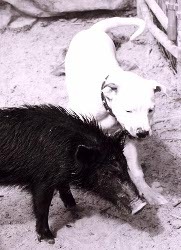 Boy, was I mistaken, we took him into a 150' corral with a small hog in it and another young bay pup that had been in 2 or 3 other times (she had never shown any interest the other times). I drug S'eamus into the corral just like I figured I would, he stayed fused to my calf, not wanting to ever get 1 inch from my side, then he saw the pig. Have you ever walked into a situation, something seems familiar, but you just can't quite figure out what you are supposed to do, then suddenly everything comes flooding in. That was what this was like, S'eamus ran to the pig and hit it with his chest, he did this a couple of times, hmm that didn't work, then he tried grabbing it by the ham, when that didn't produce the desired result, he went for the ear, BINGO it was on!! After that moment, every time he went after this or the second hog, he went straight for the sweet spot, the ear. If you knew S'eamus you would know that he is the kindest most loving dog there ever was, there is truly not a mean bone in his body, unless you taste like pork. I saw a side of him yesterday that I have never seen, this came from somewhere that had nothing to do with training or experience, It came from his soul. It was there when he was born and it will be there when he dies. My Grandfather Coulter Hoppess had a saying that he used when he saw someone or something perform an act that they were truly gifted with, something that was obvious The Good Lord had given them the tools to do better than most others, whether it was a great athlete or a talented business man or even something as simple as a winning race horse. If S'eamus could speak, he would tell you the same words; "I'm a catch dog born, I'm a catch dog bred, and when I die, I'll be a catch dog dead". "I'm a catch dog born, I'm a catch dog bred, and when I die, I'll be a catch dog dead"